Vascular calcification is associated with cardiovascular disease in hemodialysis (HD) patients. 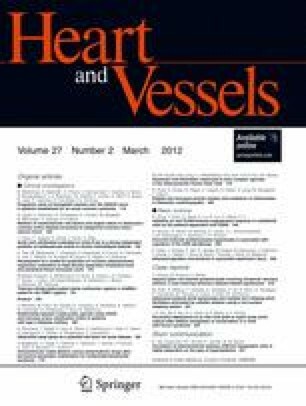 Some reports have previously shown that simple assessment of aortic calcification using plain radiography is associated with cardiovascular (CV) events; however, these studies simply assessed whether aortic calcification was present or absent only, without considering its extent. Here, we evaluated the validity of grading aortic arch calcification (AoAC) to predict new CV events. We retrospectively reviewed chest X-rays in 212 asymptomatic HD patients who underwent measurement of pulse wave velocity (PWV) in 2006 without a past history of CV events. The extent of AoAC was divided into four grades (0–3). Among these subjects, the follow-up of CV events in 197 patients was completed. At baseline, AoAC grade was positively associated with age, dialysis vintage, PWV and parathyroid hormone levels, and negatively correlated with body weight and body mass index. Arterial stiffness, as determined by PWV, was also correlated with increasing AoAC grade. Eighty-nine CV events in total occurred during a mean follow-up period of 69 ± 45 months. With multivariate adjustment, Kaplan–Meier analysis showed that the incidence was significantly higher in patients with higher AoAC grade (grades 2 and 3) than in those with grade 0 or 1 (p = 0.013, log-rank test). Multivariate Cox proportional hazards analyses showed the predictive values of AoAC grade were significant (hazard ratio 1.512; p = 0.0351). AoAC detectable on chest X-ray is a strong independent predictor of CV events in accordance with PWV. Risk stratification by assessment of AoAC may provide important information for management of atherosclerotic disease in HD patients. This study was supported by a Grant-in-Aid from the Japan Promotion Society for Cardiovascular Diseases. We have no conflict of interest to disclose.